TONIGHT- I’ll be at the Comfies EP release show at the End, which also features Tristen and probably another band, but that band hasn’t been listed anywhere that I can find. Regardless, this will be a good show. SATURDAY- Break out your old flannel and ripped jeans from high school and wear them to My So-Called Band: the Ultimate 90’s Experience at Mercy Lounge. Or check out Henry Rollins at TPAC’s Jackson Hall. Or check out Dave Cloud, Diet Blood, Marj!, Square People, and Deluxin’ at Open Lot. 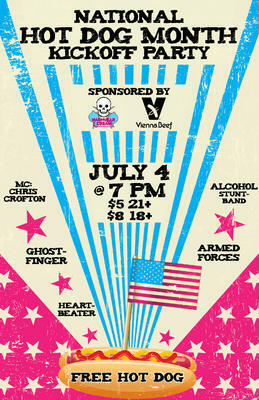 For the 4th, there’s really no excuse to not be at Mercy Lounge for the Nashville Cream/Vienna Beef sponsored “National Hot Dog Month Kickoff Party.” I’ll be doing a photobooth, you can watch the always-awesome downtown fireworks from Mercy’s kickass balcony, AND be treated to the sounds of Ghostfinger, Heartbeater, Alcohol Stuntband, and the Armed Forces, all MC-ed by Chris Crofton. And one more thing- everyone gets a free hot dog. All this for the patriotic price of $5. ($8 if you’re 18-20.) Doors open at 7pm so be sure to get there early, because everyone will be elbowing for a good spot to watch the fireworks from on the patio, and the fireworks generally start around 9 or 930pm. The bands will start immediately after the fireworks.